After five weeks of games, the New York Excelsior found itself in the stage title match again, this time against the Philadelphia Fusion. This time though, it was New York who would pull off the reverse sweep, taking the stage 2 title and prize in an exciting 3-2 finish. The Fusion came in hot off a hard-fought win over last stage’s victor the London Spitfire. Throughout this stage, Philly was surging thanks to an influx of new talent and continuously impressive performances from members like Lee “Carpe” Jae-hyeok. New York, meanwhile, was looking for redemption. The Excelsior were snubbed in the stage one title match by a Spitfire reverse sweep. While the team wouldn’t get another shot at London, it could still take the top spot after a first-place finish in regular play. In game 1, the Fusion set the tone. After a two-point finish on offense, the Fusion gave little ground to New York, holding them to zero points in a frantic fight over the payload. Philadelphia kept the good times rolling, taking a 2-0 advantage on the control map Lijiang Tower. Josue “Eqo” Corona shone on the final point; the stage 2 newcomer had a fantastic round as Pharah, landing a beautiful barrage on a clumped and helpless Excelsior. At halftime, things looked grim for the Excelsior. The top team of stage 2 was just a map away from losing the title match again. But whatever was said in the New York locker room clearly worked. The Excelsior came out renewed, looking like the team that had dominated the league for so long. Through each map, New York staved off defeat, storming through Philly’s defense and holding strong on the other side of the ball. Bang “Jjonak” Seong-hyun was slamming players with a fistful of Zenyatta orbs, and Kim “Libero” Hae-song was finding his groove on Widowmaker. Philadelphia was giving them a fight, but were ceding ground where they hadn’t before. On the final map, Watchpoint: Gibraltar, Philadelphia pushed the payload deep into New York territory and set a high bar for the win. The Excelsior were game for a fight however, and took the final point they needed to secure the win. New York takes the stage 2 title and a cool $100,000 in prize money, but each team gets a moral takeaway. 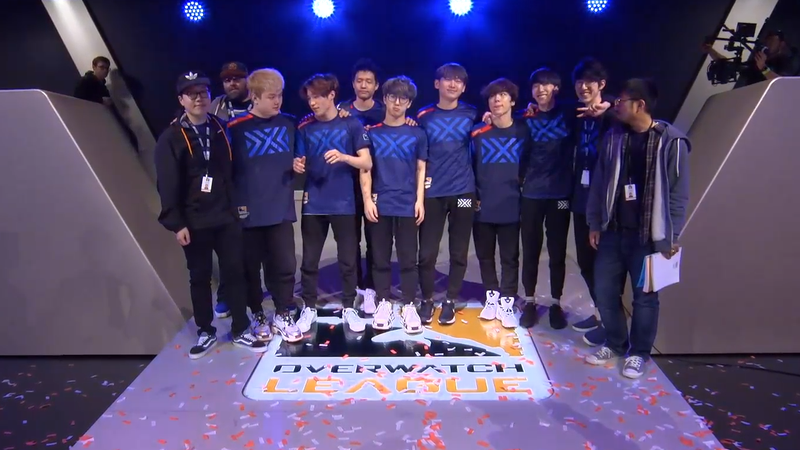 The Excelsior have proven they can close out the stage and have asserted their seat atop the standings; the Fusion can go home with a content second place, knowing they took the best team to five maps and can brawl with the best. After all, the Overwatch League’s inaugural season is only halfway done. There are still plenty of games to close the gap.